You can adjust the indicator inputs to plot the 3 lines at any time or switch any of the lines off. The original code for plotting vertical lines used the extended trend lines method. The disadvantage of this was that lines could only be plotted in the price bars panel. 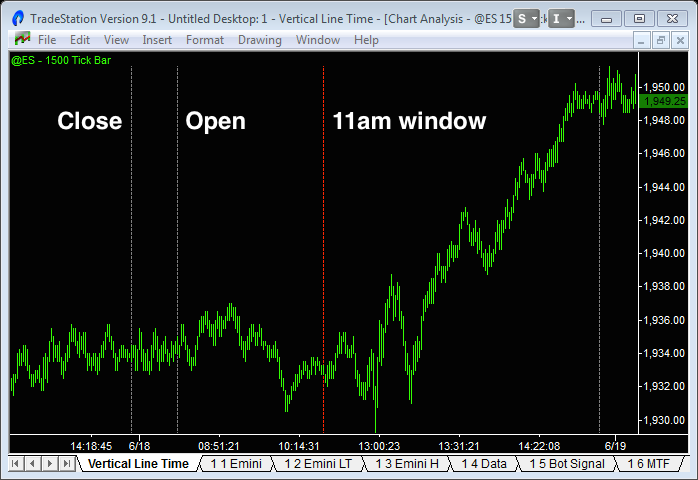 Using the new EasyLanguage drawing objects method, these vertical lines extend from the top of the price bar panel to the bottom of any additional indicator panels. This is useful if you have signals generated in the indicator panels below and you want them to extend upwards into the price bars panel. You can watch the video and download the updated code here.